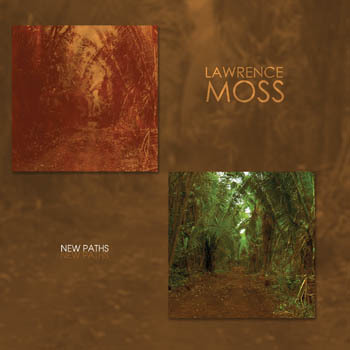 The 83-year-old US composer Lawrence Moss shows no signs of slowing down, based on the 2-CD compilation of his recent chamber works, New Paths (Innova 777). In fact quite the contrary. Nor is he converting to a more conservative style of writing, as tends to be current these days. In the composer's words "New paths in old forests. These are not the paths to Neo-Romanticism or any other 'old growth' but rather walks along the trails that lead from Stravinsky and Schoenberg to Varese and Ligeti." The music certainly reflects those sentiments. One CD is devoted to instrumental chamber music; the second features the solo voice in a variety of contexts. I was most impressed with the music on the first volume; the second took me a bit more to get used to. Disk One brings to our ears a number of gems. "The Woods" features the Capitol Woodwind Quintet in four lively movements that make use of bird song and a little humor in Moss's brief bowdlerization of the nursery song "Four and Twenty Blackbirds." There is an understandable influence of Messiaen, and yet the music does not sound imitative, instead rather Mossian. The program goes on to present Moss's somewhat quirky modernism in relatively short pieces for solo piano, oboe-viola-piano, trumpet duo, solo flute with electronics and his "String Quartet No. 4," a work that has sonorous brilliance. The second disk has several more short, interesting instrumental works, two for string duets and one for violin and piano. The bulk of the disc is devoted to songs and song cycles for soprano and percussion, one for two sopranos and piano, and the five-movement "Another Dawn" for soprano and chamber ensemble. It always has seemed to me that the solo vocal performance of highly involved modernist works constitutes one of the musically most challenging tasks in the Western world. The sopranos in the works represented here certainly are up to the challenge. There were occasions, however, where I thought the voice qualities occasionally seemed over- or under-matched to the music at hand, though perhaps those vocal qualities were what Maestro Moss had in mind. In any case I would like to hear some of these pieces in the hands of other vocalists for comparison. Nevertheless the works themselves hold interest throughout. The three movement "Emily's World" has very interesting two-soprano writing, where close harmonies sounding within the advanced, expanded musical universe as set up by the piano part give the music an almost otherworldly quality. The set concludes with the sonoric and phraseological gem "Another Dawn," which takes on the serialist counterpoint of classic mid-twentieth century ultra-modernism and converts it to a Mossian poetry of means. The (chamber) orchestration has brilliance and the contrast of the resonantly chambered soprano voice and the texturally diverse chamber group is convincing and dramatically engaging. So here we are. Lawrence Moss at 83. The music comprises to me a rather essential set for those looking for high modernism and what it has become in our era. Definitely recommended.